Why has Africa become such an important priority for Britain's foreign policy under New Labour? What interests and values is the UK seeking to uphold by intervening? Why has aid to Africa more than tripled over the past decade? How has the UK's involvement in the War on Terror affected its efforts there? In Britain in Africa Tom Porteous seeks to answer these and other questions about Britain's role in Africa since 1997. He provides an account of the key players, the policies they constructed in the shadow of the war in Iraq and the future of Britain's engagement with the continent. 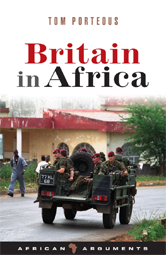 This book sets out the balance sheet of what Britain has achieved, and where and why it failed in Africa. A compelling read, whose importance for international politics reaches far beyond Britain or Africa.